These studies provided insight into nitrogen (N) management of leafy green vegetables. Organic fertilizer evaluations showed that 4-4-2 and 12-0-0 released about a third of the N when left on the soil surface, and 54 and 86% over the course of the cropping season when incorporated into the soil, respectively. Phosphorus release from 4-4-2 was low due to the high pH's of soils at all sites. Quantities of N applied as fertilizer ranged from 1.4 to 3.9 times crop N uptake, but discounting the amount of N that actually mineralizes from the organic fertilizer, N applications ranged from 0.4 to 1.9 times crop N uptake. This observation indicates that many of these crops relied on other sources of N to meet crop needs. Quantities of N mineralized from soil organic matter were modest for each site, and the quantity of N in irrigation water was also low at 9 of the 10 sites. Residual quantities of mineral N in soil were high at most sites and may have been a key source of N for crop growth. Preplant measurements of residual mineral N using the nitrate quick test may be a useful means of understanding if fertilizer rates can be reduced. Organic production in Monterey County was valued at $365 million in 2016, which was 8.6% of total agricultural value. Organic agriculture has a prominent role in Monterey County agriculture, but many aspects of organic production are still poorly understood and are in need of more research. The transformations of N that occur in soil, and organic amendments and fertilizers that ultimately produce plant available forms of N (nitrate and ammonium, a.k.a. mineral nitrogen) are only understood in a general way. In the 2016 and 2017 seasons we conducted evaluations of N mineralization (release of mineral N from soil organic matter) from soils on organic farms and from organic fertilizers. Evaluations included determination of the mineralization of soil organic matter over the course of the cropping cycle of baby vegetables and full-term romaine and broccoli. In addition, evaluations were conducted of mineralization of organic fertilizers in production fields as well as laboratory incubations. In 2016 and 2017, twenty N mineralization trials were conducted in the Salinas Valley with cooperating growers in commercial production fields in diverse locations and with a variety of soil types. Field evaluations consisted of establishing replicated unfertilized areas in each field. Within each unfertilized plot, we had areas with and without plants, as well as an area covered with plastic mulch; these areas allowed us to estimate the amount of N mineralized from soil organic matter without the confounding factors of crop uptake and leaching. Unfertilized areas were compared with adjacent fertilized plots. In 2017, the amount of N mineralized in field evaluations ranged from 6.3 to 45.1 lbs N/A over the course of the crop cycle and was generally modest in comparison to crop uptake (Table 1). In addition, net N mineralized from applied organic fertilizer was less than crop uptake at 6 of the 10 sites. Nitrate-N in the irrigation water was low at all sites except site 6. In comparison, residual soil nitrate-N at the beginning of the cropping cycle was quite high at all but two sites. Given the short crop cycle for most of the crops evaluated in these studies and the lag in the releases of mineralize N from organic fertilizers, the question arises, is a measure of nitrate-N at the beginning of the crop cycle a useful indication of the amount of N available for crop growth. 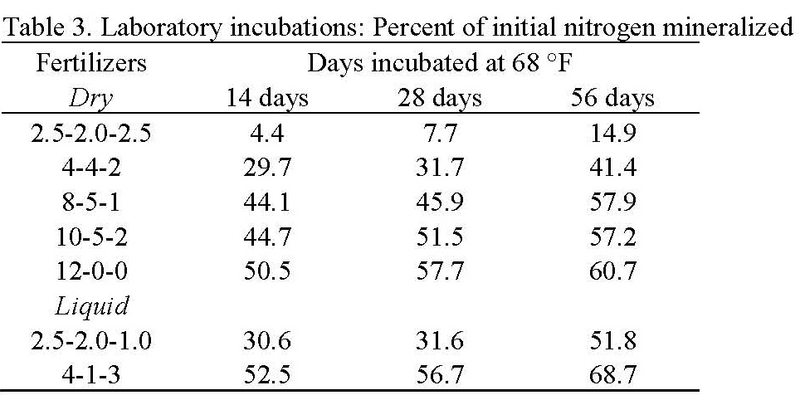 For baby vegetables that mature in approximately 30 days, a preplant evaluation of the available pool of nitrate is the only reasonable time to take this measurement because the lag time in the release of nitrate from organic fertilizers makes it impractical to test later in the crop cycle. The disadvantage of relying upon a preplant evaluation of soil nitrate is that leaching with the germination water could move the measured nitrate beyond the reach of the developing crop. 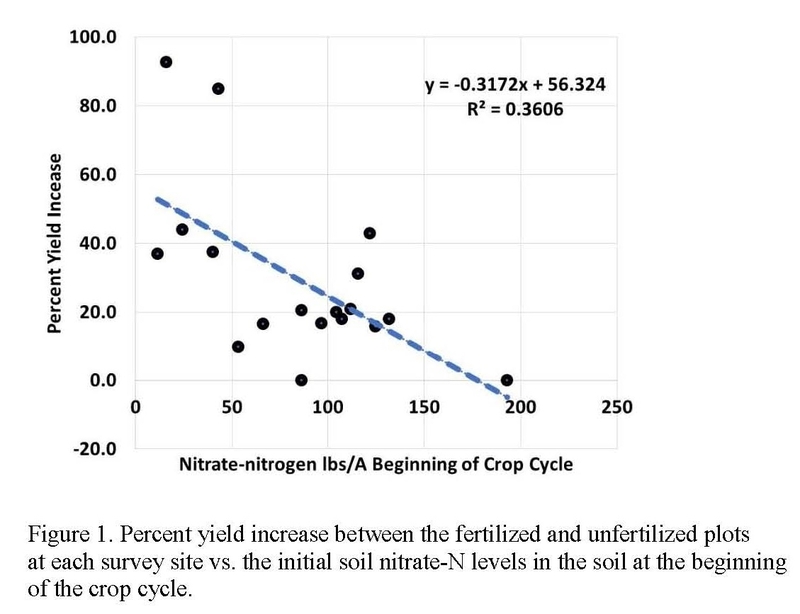 We observed modest yield increases even at sites with 80 to 130 lbs of residual nitrate-N/A prior to planting (Figure 1). 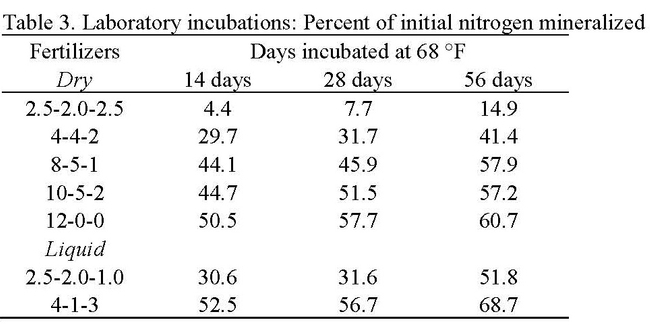 From these studies, it appears that the utility of the preplant nitrate-N test is not in being able to skip a fertilizer application, but rather with adjusting the quantity of fertilizer applied. How much the quantities of applied N can be reduced is a question that needs further study. Organic fertilizers used in the production of cool season vegetables are applied by either incorporation into the soil or applied to the top of the bed (a.k.a. drop-on-top) and incorporated with sprinkler irrigation. 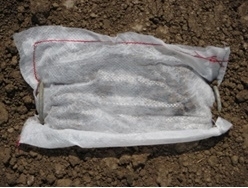 We mimicked these application methods in studies in which we placed organic fertilizers in polyethylene pouches (See photos below) and applying them to the soil in two ways: 1) burying them 3 inches deep to simulate incorporated applications and 2) by placing the pouches on the soil surface to simulate surface applications. The 2017 evaluations were conducted in a commercial production field and the pouches were placed in the field at the beginning of the crop cycle. Four pouches were collected weekly and the contents were dried, weighed and analyzed for N (12-0-0 only) and for phosphorus (P) and potassium (K) (4-4-2); the rate of disappearance of nutrients from the pouches estimated the rate of plant-availability. Organic fertilizers used were 4-4-2 (chicken, meat and bone meal) and 12-0-0 (feather meal). The pouches were placed in the soil at the beginning of the crop cycle of full term romaine on June 19 and the final set was removed on August 14. Surface applied 4-4-2 released 24.1% of its N in the first week of the evaluation and then slowly released a total of 36.1% over the next 48 days (Table 2). Buried 4-4-2 released 30.3% of its N in the first week and a total of 54.0% over the next 48 days indicating that burying the fertilizer released greater quantities of N faster than surface applications. Surface applied 12-0-0 released 12.8% of its N in the first week of the evaluation and released a total of 31.5% over the next 48 days. Buried 12-0-0 released 30.7% of its N in the first week and a total of 86.0% over the next 48 days. Burying 12-0-0 had a more dramatic impact on the release pattern of N than for 4-4-2. 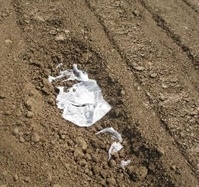 The amount of P released from 4-4-2 in surface and buried applications was 10.9 and 8.5%, respectively which was low. The amount of K released from the surface and buried applications was 70.2 and 85.3%, respectively, which was high. Theseevaluations show a rapid release of N from the organic fertilizer over the first 1 to 2 weeks after application. After that time, the rate of release of N slows. Burying the material increased the rate of N release and particularly so with 12-0-0, indicating that fertilizer with a higher N concentration release N faster. It is possible that the pouch evaluations overestimate the N release rate because of movement of small particles of fertilizer that filter out of the pouch; this idea is supported by observations in a laboratory evaluation conducted at UC Davis that showed a 20-30% lower rate of N release of 4-4-2 and 12-0-0 over the same period of time (Table 3). The amount of N applied as fertilizer ranged from 1.4 to 3.9 times crop N uptake. However, counting only the fraction of organic fertilizer N assumed to be mineralized, N applications ranged from 0.4 to 1.9 times crop N uptake. The net amount of fertilizer N made available from the organic fertilizer was less than crop uptake in 6 out of the 10 fields. This data would suggest that the organic crops were commonly under fertilized, but tissue N evaluations at harvest indicate that only one of 20 fields evaluated might have been low in nitrogen. It appears that the crops were getting their needs met from the other sources of N: residual pool of nitrate, in-season mineralization and nitrate in the irrigation water. Soil pH at the evaluation sites ranged from 7.4 to 8.1, indicating that measurement of soil Olsen P was the appropriate means of measuring available P. Soil P values at the sites ranged from 21 to 51 ppm with a mean of 38. These P values are similar to values encountered in comparable commercial production fields (mean of 37 ppm P). Quantities of elemental P applied to these crops ranged from 35 to 86 lbs P/A (80 to 200 lb P2O5/A), which is quite high. Six of the ten sites have been in organic production for more than 10 years, and assuming similar fertilizer practices occurred over this period of time, it is surprising that the levels of P in the soil have not risen to higher levels. We attribute this lack of soil P enrichment to the fact that P in the form of bone meal remains unavailable in high pH soil. The fertilizer pouch study confirmed that only a small fraction of the P in the 4-4-2 fertilizer was released from the pellets.